The really interesting part of the data collection represents those sites that are in the middle ranks. 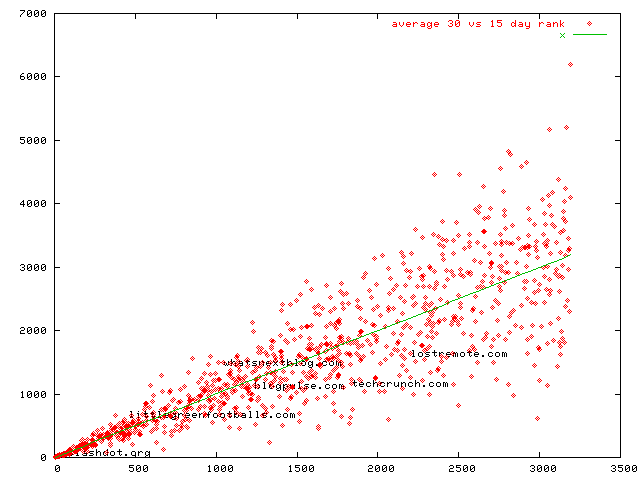 The mid-ranked sites have the most volatile ranks -- they gain and lose rank in drastic swings on a day to day basis. It is in the middle ranks that the real "battle for attention" is taking place. In those middle ranks, isolated from both the peaceful zone at the "top" occupied by those who have already "won" and the quiet zone at the bottom where live those who haven't even begun to fight, we see a constant and vibrant battle of ideas, personalities, voices and styles. Of course, this vibrancy of the middle is what is to be expected given everything that we know today of power laws, network effects, and the long tail. The folk at the top of the pile have the "authority" or "popularity" that they do today in large part because they had it yesterday. The folk who are at the bottom of the pile are there today because that's where they were yesterday. It's the folk in the middle -- on their way up or down -- that see real movement on a day-to-day basis. The really useful place to look, if new information or new ideas is that you're interested in, is the middle ranks. As Aristotle said long ago: "Seek the mean." That's where the good stuff is. Hi, Bob. Any thoughts on how many blogs there are in this middle rank of good stuff weblogs? Jim Lanzone said that only about 1.1M weblogs have even one subscriber. The subset of interesting weblogs -- blogs that are interesting enough to have at least a couple dozen readers -- is likely a small fraction of that. What do you consider to be the end of the middle rank? How many of the 16M weblogs out there would fall into the upper or middle ranks? How many of the 16M weblogs are interesting enough to be considered good stuff? "The harsh reality is that those with the lowest ranks tend to stay that way. Those with the highest rank tend to keep their high rank."